I decide to jump right into the install before doing any messing around. I like their logo, “Punny Name, Serious Distro”. Not surprisingly for a distro that started off as a modified Fedora, it uses anaconda for installation. The first question I get is the hostname. Then comes timezone and root password. After that is partitioning and the install finally begins. Overall, not too many options. It’s neither the easiest installation ever nor the hardest. I’d say it leans towards very, very easy, but I think Linux Mint actually wins for the easiest, nicest installer. (And Ubuntu – which I haven’t installed for a few months now might edge it out of second place) Overall, the installation is extremely quick, but I’m cheating in that it’s in a VM so, of course, I don’t need to worry about CD or DVD drive speeds. Fuduntu also uses Smolt – which is pretty smart. After that I eneded up at GDM. After logging in I took a look at my desktop. No icons – not a problem for me since I use KDE and they don’t really have icons on the desktop any more either. The bar at the bottom of the screen does not have the icons expand when you hover over them like a Mac. When you open up a program, it gets a little triangle underneath the launcher icon. Whichever program has focus has a little blue box around it. When you open a new program it just gets added to the bar while it’s open and so on – just as these bars tend to do. 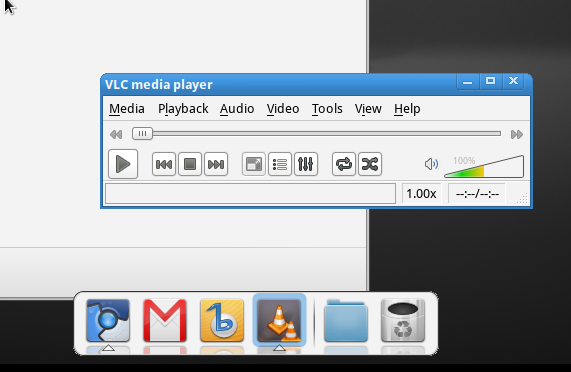 Interestingly, there’s no virtual desktop switcher. Maybe that’s because they’re considered too hard for new users? Overall, the one advantage over Fedora (on initial install) is that Fuduntu has non-free packages like VLC and Adobe Flash. For graphics it only has Shotwell Photo Manager. No GIMP there. Internet has Chromium, dropbox, Empathy, Google Mail, and an RDP client. For office, it has Google Docs interestingly. It’s definitely a different choice than the usual Open Office, but most people do things on the cloud now. It wouldn’t work for my wife or for me, but it would probably work for most people. And music is provided by Banshee. I decided to take a little look at the repos. Blender is not in there. LibreOffice IS available if you need it. The games category only has Fortune-mod. So it looks like the repos aren’t as full as Fedora repos. In the end, Fuduntu fits in a very interesting niche. It is very pretty to look at, but it’s using old Gnome 2.x tech. What will happen as more and more things move exclusively to gtk3? Will they remain backwards compatible? Will it force Fuduntu to move forward? 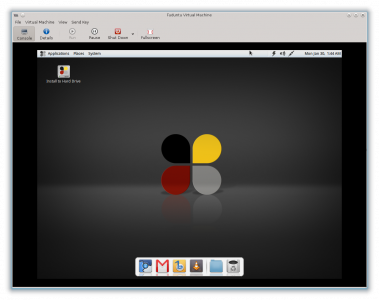 KDE can recreate that layout – so maybe they just move to KDE. It also doesn’t have as many packages in the repo. I’d say that it’s a great intro distro to introduce to a student or someone who can use it to explore what Linux is all about. After that they may need or want to move to Fedora or Debian (and family) to get more packages and a more rounded out Linux experience. The Fuduntu team has done a VERY good job. Time will tell what happens to their small distro. I’m Jeremiah, one of the Fuduntu Team members. We really appreciate the review. 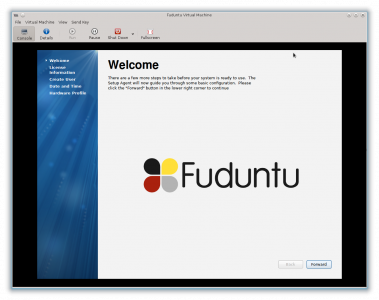 The Fuduntu team prides itself on having a close relationship with our community of users. We try to provide solutions to every user’s request. Since you’re the first to mention it, you’ll now find Blender in our Testing repository. It will have to go through the standard review process, but you should find it in our Stable repository in a week or so. That’s pretty awesome, Jeremiah! With that much focus on the community, I see good things on the horizon for your distro! Keep it up! Works like a charm and is stable. Unfortunately i cannot say the same for Fedora, had several stability issues 7 months ago.